I've just got back from my first proper run in my new foot protectors - my Vibram Five Fingers Classics. I say foot protectors as "shoes" just seems like the wrong word to use considering they're effectively just a bit of strong rubber stuck to the bottom of my feet. Well, all I can say is... Wow!! I love them. It's like running barefoot without having to worry about sharp objects jamming into your feet or scuffs, and best of all, in a matter of minutes you're forced to run properly. If you're a heel striker, you won't be for long. These things have absolutely no cushioning, so slamming down on your heel is going to hurt. Thankfully I'm a forefoot striker so didn't have the "pleasure" of experiencing the jarring pain shooting up through my body from my heel. I also imagine pronators and supernators will soon find they no longer pronate/supernate with these bad boys - I can't imagine anyone pronating or supernating when landing on the ball of the foot. They force me to use my body's natural shock absorbing features to do all the work. Hopefully this will force me to run properly, after all nothing is as "proper" as running barefoot - ever seen a Kenyan runner with bad running form? 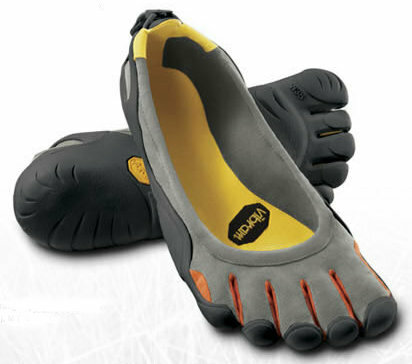 I think the Vibram Five Fingers are pretty damn cool. The Vibrams were delivered last week, but unfortunately I guessed my size incorrectly, so had to send them back and swap them for a smaller pair. These arrived on Tuesday and I took them for a little spin on Wednesday, just to see how they were. I knew then I was going to like these and really wanted to go for a longer run. The short little stint I had in the park was great, but Vibram recommend you get used to walking around barefoot and in the Five Fingers before going whole hog into running. As the first thing I do every night when I come in from work is take off my shoes, I'm pretty used to walking around barefoot, so I thought I'd take my Vibram Five Fingers out for a proper run today, and boy am I glad I did. Today's 3k run was fantastic. Within about 100m I could already notice I was running with a much gentler strike, but without actually trying to land softly. I've been reading up on the POSE method of running, so I applied some of the suggested techniques and in no time at all I was gliding along smoothly and comfortably, bar the odd pebble and stone I encountered. I think given some time, my feet will be used to these and I won't really feel these much. My only niggle was the ball of my left foot was a bit tender towards the end of the run. This wasn't really surprising as I'm on the process of "bazooka-ing" a verruca on the ball of that foot, so tenderness can be expected. All in all, I think the Vibram Five Fingers are great and hopefully will force me to be a more efficient and injury free runner again. Who knows, maybe I'll migrate away from those at some point and become a hard-core barefoot runner. That'll certainly save me a bob or two every year.